The ABS ball valve allows water flow to be regulated, and even stopped on a length of solvent welded rigid pipe. 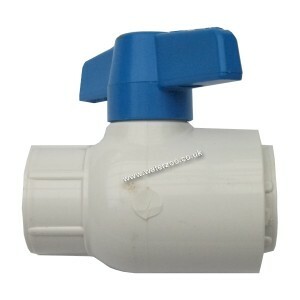 High quality ball valve forms water tight seal when off. This type of ABS pipe work is measured from the inside, so a 3/4" fitting is to fit ABS pipe with a 3/4" internal diameter. The actual internal diameter of the ABS ball valve is 26mm.